I seem to be as slow as all get-out this week ... here it is Thursday and I haven't even updated this with my current Ebay offering. I have no excuse - other than that I have been catching up doing fun things, like laundry and cleaning and running around doing errands. All the things that I let go when I wasn't home for fifteen minutes all week. Off to Allen, Texas, these little guys are ... sounds like a wonderful place to go! 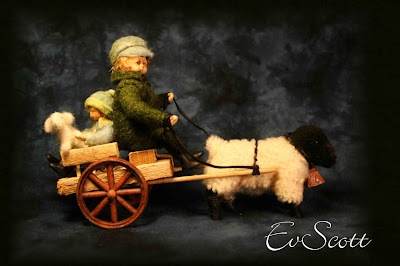 This little set has the first Suffolk sheep that I've done. 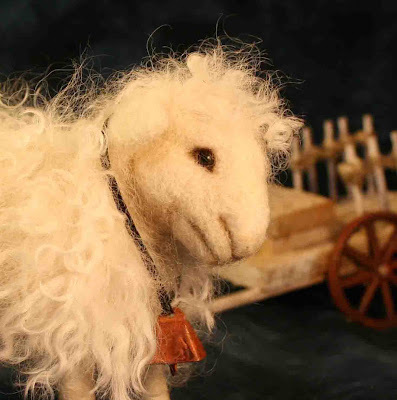 Which is kind of strange since I LOVE Suffolk sheep. When we moved here 21 years ago, we raised them. We lived on just an acre of land, so having a farm gave us the opportunity to be 'Farmers' and sheep seemed like a good idea at the time. We got 40 ewes and two husbands - Rambo & Ramsey. I love the peaceful scene of sheep grazing, and I was sure that it would be oh-so-wonderful to have those adorable, ever-so-sweet baby lambs scampering around. Is anything cuter? (Except donkeys of course). But sheep farming is NOT as easy as it looks - it takes knowledge and expertise and a different heart than I've been blessed with. Lambing time is huge work & the ewes or little lambs can run into difficulties. One time that sticks out in my memory, I was sick & laying down. Jaime, who was 11 at the time, went out to the barn to check the ewes & found one labouring in distress. Rather than disturb me, she called her Dad at work and asked him what to do. He said 'Go inside her with your arms, right up to your elbows, & pull the baby out'. Well ... she did. I still totally marvel at how independent and brave she was. She delivered two little lambs that were very weak & couldn't stand to nurse. It was a frigid, cold night so we brought them into the house & put them in a cozy box in front of the woodstove so we could feed themwith a bottle every half hour. It was New Year's Eve & we were watching 'Old Yeller' on TV. Jaime went out to the kitchen in a commercial and came back crying. I said 'Old Yeller makes me cry too' ... she said 'It's not that ... my lambs died and it's not fair because I gave birth to them.' And it wasn't fair. 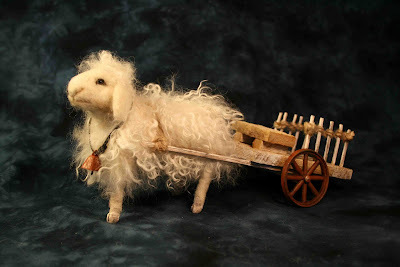 Every time we lost a little lamb, it broke our hearts. When we were told, very matter-of-factly by an experienced sheep farmer- 'A sick sheep is a dead sheep. ', we were horrified. Of course, it's not necessarily true I suppose, but it was enough for me to decide that sheep farming was NOT the answer. That, and the fact that it was getting hard to keep myself convinced that every single lamb was moving off to a loving home where it would have a long and happy life. 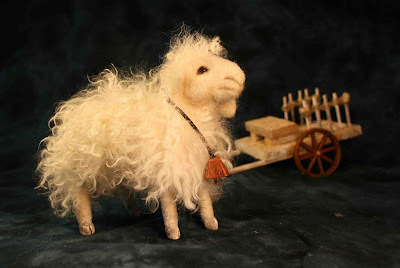 No more sheep farming for us. I'll stick to watching them graze somewhere else and just make my own ... knowing that in fact they ARE moving to a loving home where they will live a long and happy life. 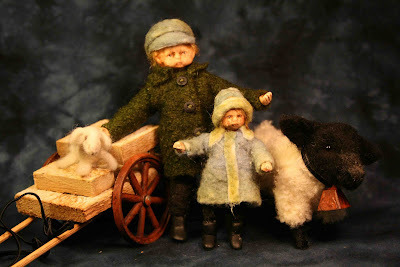 In honour of the birth of our first baby in two years ... the first of the new generation - I have created a needle felted version of Samantha and Xavier Peter. My very first female donkey (1981) was Samantha's Mom - Molly. 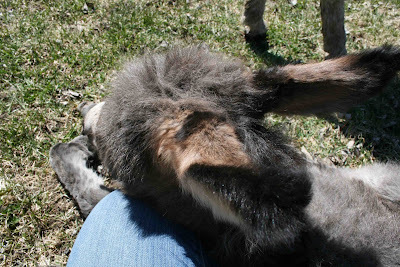 She was six years old already when I got her - a sweet donkey with gentle, sad eyes. 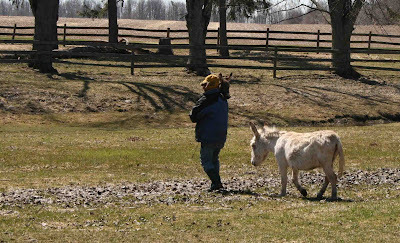 Her first husband - my very first donkey - 'Donkey Otie', pased away & I got Nugget as a 6 month old baby. When he was old enough to do his job, he had issues with poor sweet old Molly - he thought that she was old & fat & out of shape and he spent all his time and affection on the young gals, which was very sad for Molly. There was nothing that she wanted more than to be a mother - she dearly loved her babies & was such a good Mom. But the babies were few for Molly over the years as Nugget mostly refused to oblige. One year he did & we eagerly anticipated her baby. When she was born, we were shocked to see that she was pure white. Molly, in an attempt to make Nugget jealous, had an affair with our our white, standard sized donkey, 'Sam'. 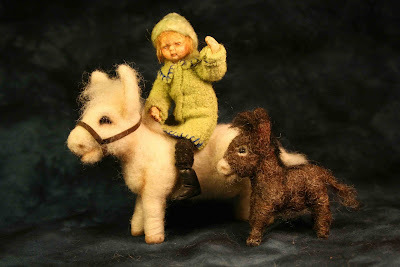 He was such a fine specimen of a beautiful baby donkey that his image as was etched into glass in Sweden - he was very famous. Sadly though,we went out one day and there was 6 month old Samantha, standing beside Molly, who had suddenly died. She's 15 now & holds a very special place on this farm: she is the only white donkey that we have, she was Molly's last baby, she gave birth to the Nugget's final baby and to Chip's first. 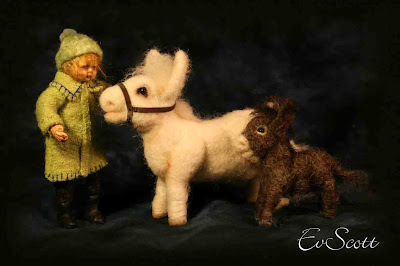 This is the first white donkey that I have ever needle felted. To answer a question ..."Yes, I still have the bear." At times, when I create a head, I find that I am holding in my hands, a face whom I recognize. It's a little disconcering when that happenss & totally unintentional - I sure couldn't do it if I was trying. It's such a surprise & it makes me smile or laugh or ponder. This time it brought a lump to my heart. 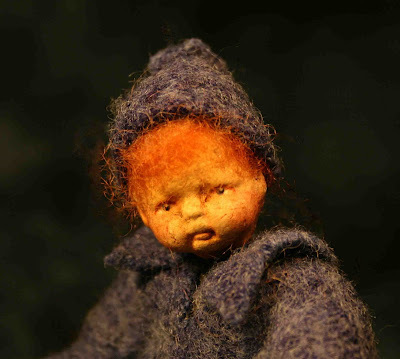 I created one of the wee children that I so enjoy - the ones from the antique German doll. Each time I make one, it comes out a little differently. 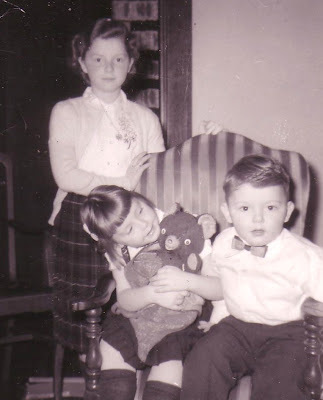 When I adorned this little fella with red hair, there in my hands, was my 'baby' brother, Buddy. Not 'Bud', the guy he grew to be, but 'Buddy', the pudgy faced little boy with our signature auburn hair. He was the last child in our family of 7 kids - 22 months younger than me. Prior to his birth, my parents had lost two sons & a daughter (my oldest sister actually died as well - from leukemia, just a couple weeks after the picture above was taken) - so the arrival of this long awaited boy was a major deal. He was named after my Dad -'Harold Joseph', but the story goes that I announced that he was my 'little budder' & hence he became 'Buddy' - Bud as he got older. 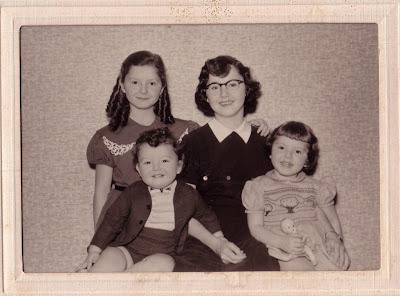 My sister was five years older than me, seven years older than him - far too mature and sophisticated to be hanging out with such irritating babies, so we teamed up against her. 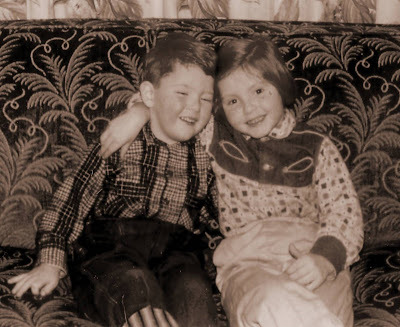 We lived in the country, with no other children nearby, so for my first 11 years, he was my only friend and playmate. I forced him to play 'house' with me; I played 'trucks' with him. We spent hours and hours with Tinker Toys & Lincoln Logs & pre-Lego little plastic red bricks with windows that you could set in that actually opened. I was far more the 'animal lover' than he was - he preferred a fishing rod. When we left the electric train & doll house behind, I went in my direction - to the barn to be with the horses & my pony & the kittens. He went to the creek & fished and caught all kinds of disgusting slimey creatures. He was about 7 or 8 when he stayed at the trailer with my Dad - Mom, Pauline & I came later. Like it was yesterday, I remember my Mom tucking him in the top bunk & he said to her - "Be careful, I'm missing my frog." She squealed & said "OH NO - we have to FIND IT!" He said - "Don't worry ... the snake will probably eat it." And there, curled up in the covers with him was his latest pet. He wasn't nearly as attached to the fur type animals as I was, but he did get attached to a couple strays. We lived on the edge of the village & too often animals were discarded right in front of our house. One particular dog, Bud became instantly attached to, which surprised me, as I was the one who was always wanting to keep every stray I found. She was a real Boy's dog, a big German Shepherd he named Lady, who became his constant companion. It made me happy to see him love a dog. One day, I found him hiding in the corner of the garage, crying. It took forever for me to get the reason out him. He just kept saying 'It's my fault, it's my fault.' He had been walking on the side of the road, right in front of our house, with Lady right at his side as always. She went on the road, was hit by a car & killed instantly. The car that hit her didn't even stop - just left that poor child standing there to deal with the trauma and a broken heart. I never saw him get attached to any animal again until he was an adult. 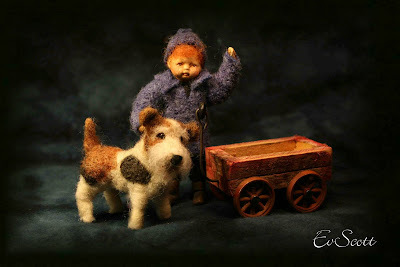 The Terrier in this piece is from one of my very first memories of playing with my brother. He was three, I was almost 5 when my Dad got a baby raccoon that we raised in the house. One of my favourite toys was a Terrier on wheels - we'd stick the wee racoon on the dog and pull the poor thing all over the kitchen - little 'Tiny' hanging on for dear life. Bud passed away suddenly, eight years ago. I miss him SO much. He is always in my heart and so very often in my thoughts. I see him though as the man who he had become - tall & handsome with a grin and wicked sense of humour. But this week, when I put the red hair on the little child that I made, there he was, my little 'budder'. Suddenly all those childhood memories came flooding back ... the dog, the raccoon, the fishing pole, the pudgy happy face ... my Buddy. 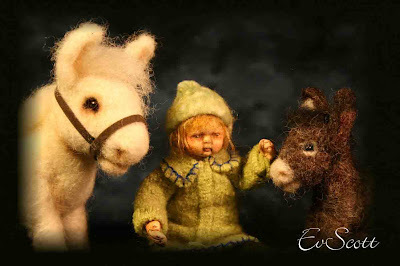 I am so touched and honoured to get to send Buddy & his buddy off to Clare, Michigan, to join numerous other creations that have come from my heart and hands over the years. to do with this delivery. I wasn't really surprised to wake up to an Easter blessing today. 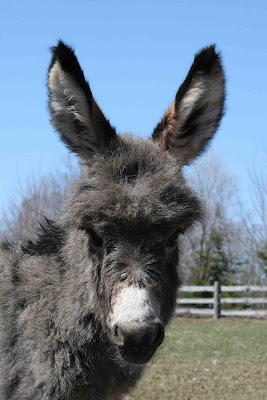 Over the years, the majority of our donkeys have been born on a significant day - we've had one on most holidays and many birthdays - as if they are a special gift. Which of course, they are at any time. This little guy who was born early this Easter morn, is indeed a gift. Two years ago yesterday, my sweet 'Nugget', who was such a big part of our lives for over 23 years, passed away unexpectedly. Besides being a wonderful long-earred friend, he was our baby maker. A few months later, his very last babe was born. offspring with Maggi. But it was never to be. We were sure she was pregnant - she was huge & we could see the baby move and turn. I don't believe that it was a 'hysterical pregnancy' for both of us, but month after month, no baby ever arrived. a young son. I named him 'Chip' because he is the spitting image of Nugget. He is four years old now - old enough it seems, to carry on his Dad's work. He did a fine job... a beautiful, healthy babe, born on a special day - he definitely is a Chip off the old block. Today, I spent hours cuddling with our Easter gift. He laid his head on my knee as we sat in the sunshine. Then Brian carried him across the creek & we made them a comfortable bed in the barn for the night. 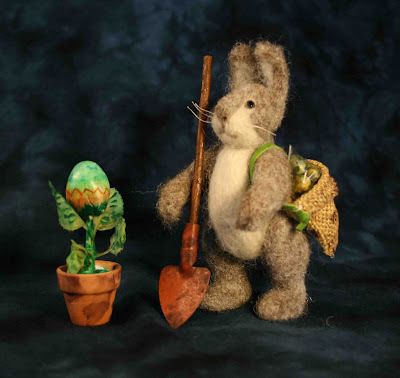 as in 'EGGSavier' & after Peter rabbit, who most likely assisted in the delivery. 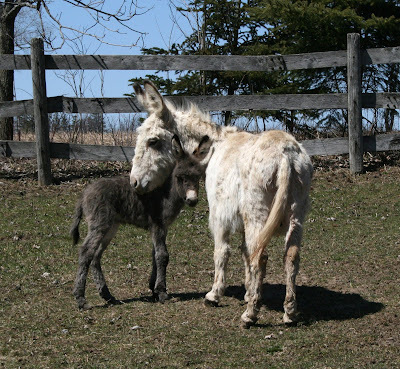 I thought after the loss of Nugget, that we would never get to experience the pure delight of baby donkeys ever again - but our little XP has arrived ... the first edition of a new generation. If it weren't so darn frustrating, it would be funny. All I can do at this point, is shake my head & hope that tomorrow I can get it straightened out. For three years, I've wanted to have more professional looking Ebay listings. I so admire the listings that are artsy & attractive. I tried a number of times last year, but just couldn't make it happen. year. Since my first listing three weeks ago, I've tried to do it. I spend hours on it each time, but some little thing isn't correct, so it won't accept my listing & then I'm starting totally over, the old way. Week after week. relieved that it finally made it to Ebay. But to my horror, when I checked to see if it truly did get where it was supposed to be going ... it was all SIDEWAYS! It looked fine and dandy from my page, but you can't even read it up there. Instead of looking 'professional', I just look like .... I don't even know what. I've put a shout out for HELP, but just in case it isn't successful, I'm putting the listing info here too. In spite of the difficulties with the listing, she still found a nice home in Washington, Pennsylvannia. Rabbits are going to be in short supply this year. Only time for two - last week's and this little guy. 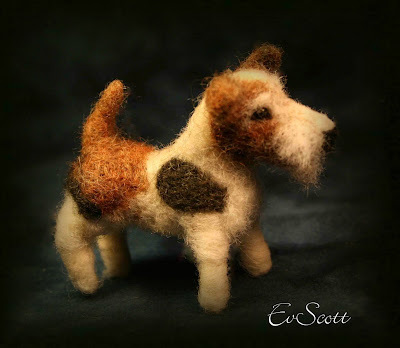 Needle felted of course. 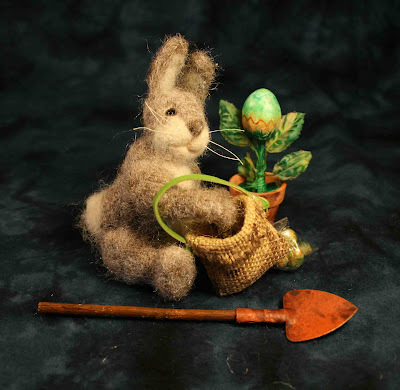 He's got a spade & a bag of 'bulbs' to plant for next year's crop - and a freshly harvested 'Egg Plant'. I betcha that they're having more 'springish' weather there, than we are here. He is going to be SO happy!